I’ve never been more challenged by a recipe. I feel like this sentence should be the first thing you read. Most of the recipes I post are meant to be a) seasonal and b) straightforward. 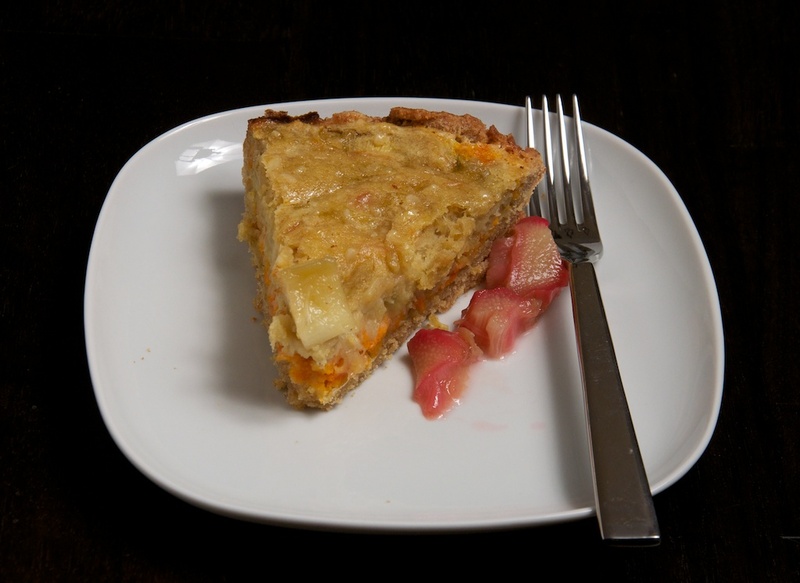 This recipe satisfied the first requirement, as rhubarb just came into season in the Northeast, but completely ignored requirement number two. There’s nothing straightforward about this recipe—at least the first time you make it. Since I’ve weathered the storm—though my kitchen, even after cleaning for an hour last night is still in disarray—the recipe at the end of this post is my adapted take, with the steps in the order I think they should be. This won’t make the recipe less complicated for you, but it should take the ‘what have I gotten myself into’ question out of the equation. Okay, let’s back up to 24 hours ago, before my kitchen had bowls stacked on the floor and before I had a half eaten rhubarb layer cake on a freshly scrubbed counter! When seasonal foods finally arrive, Justin and I tend to hit the ground running. Besides the asparagus frittata I shared, we’ve made some incredible soups and pasta with our favorite green stalk. I hope to share more asparagus recipes next week. Rhubarb is just now making a tiny peep at the market. Last Saturday, Wilklow was selling stalks. The stand had a cluster of people around it, curious about what rhubarb was and what to make with it. 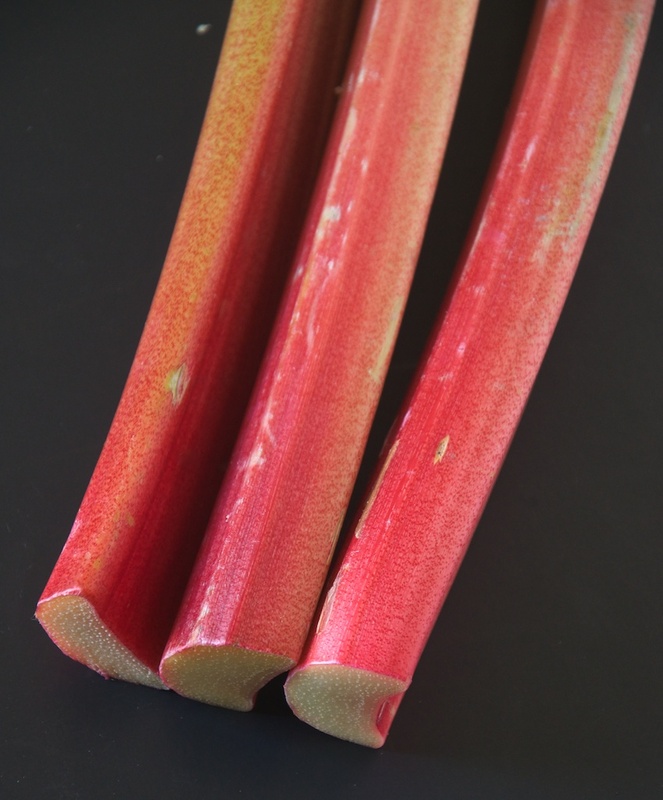 I’ve bookmarked recipes for a rhubarb pasta, a rhubarb soup, and several rhubarb jam recipes that are sure to put my kitchen, and me, through its paces. But I kept things simple with my first batch of rhubarb, making a rhubarb compote with nutmeg and cloves, perfect over ice cream or whipped into whipped cream. My second rhubarb recipe, this Rhubarb Layer Cake, ignored any desire for a gradual transition from simple to more complicated recipes and landed me shakily into ‘wanna-be pastry chef’ territory. Yesterday, after an unsuccessful trip to Whole Foods looking for rhubarb, I returned to Union Market, surprised to find a few stalks left from upstate NY. I quickly came home and got started, because the recipe had indicated the cake would take over 2 hours to prepare. Knowing how recipes tend to underestimate time when there’s just one person and no sous chef , I generously estimated the cake would take me at least 3 hours. Try 4. The recipe is all over the place—it starts by having you make the crust, before making a rhubarb confit and syrup, and then three ‘layers’ of the cake, before finally merging everything together. So, as directed, I started with the crust. It came out well—easily moldable and emanating a vanilla scent. I put the ball of dough into the refrigerator as the recipe indicated and got started on the other aspects of the cake. When I took the dough out, it was hard as a rock and completely un-rollable. I had to start the crust all over again—but this time I was out of eggs. I dragged my dough and flour covered body back to Union Market and bought more eggs. The second time I made the dough, I put it in the refrigerator for only 5 minutes—it was cold but could actually be rolled. Does anyone have any ideas why my dough became so rock hard? I’d love to hear your thoughts. By the time the cake was in the oven Justin arrived home from work to find bowls upon bowls stacked on the floor, dishes on top of the trashcan, dining room table, and every work space possible, flour all over and the kitchen, and all of the utensils out of our kitchen utensil jar (which stores 15 handy instruments) used. So is it even worth it for me to share this recipe? I think so. This cake tastes like the sweetest rhubarb imaginable, tied together with a crunchy crust (almost like what you’d find in a cheesecake). 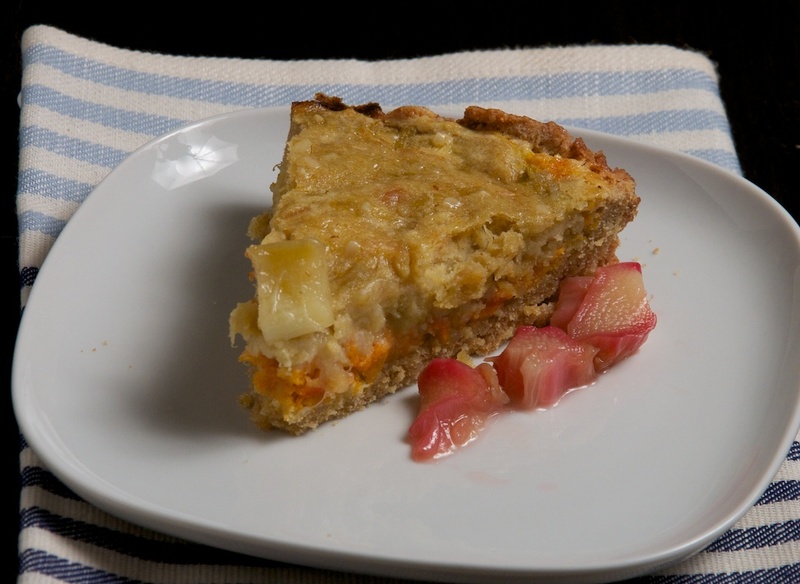 The three layers serve as progression of sweetness—the crust, topped with plain batter, holds the thicker carrot batter, before being topped with the spongy, moist rhubarb layer. It’s a deceptively heavy cake. Justin took a slice with the full intention of having another, but there was simply no room left: instead we had pieces for breakfast this morning. 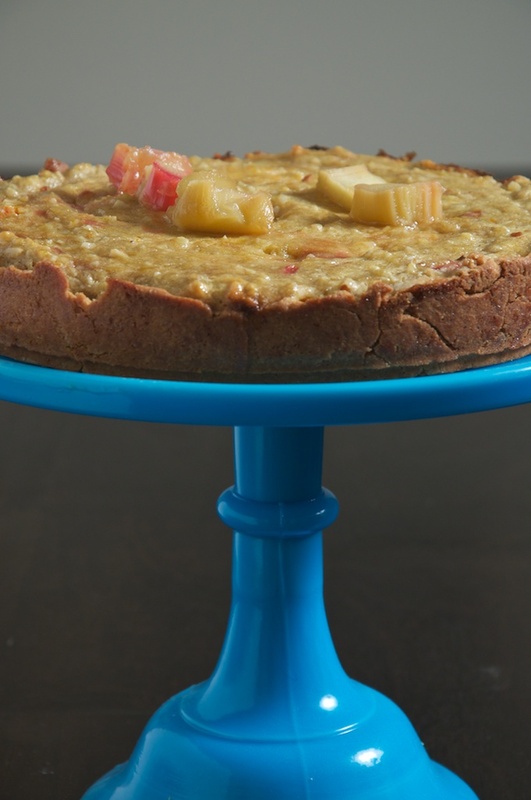 I’ll admit, there are simpler ways to enjoy rhubarb. But I like a challenge—and this was demanding. I’ve never baked anything so complicated. But ultimately, despite the difficulties, the cake was one of the best things I’ve ever made—and maybe I’ll make it again…next year. *You will need a springform pie pan for this recipe! In a large bowl, whisk together flour, allspice, cardamom, and salt. In an electric mixer, fit with the paddle, combine butter, sugar, and vanilla. Mix on medium until well combined (3-4 minutes). Add egg yolks, one at a time. Add flour mixture in two additions. Turn out dough onto a work surface, shape into a flattened disc and wrap in plastic wrap. Chill: I chilled for 5 minutes and it worked well. This is up to your refrigerator. You don’t want your dough to be rock hard! a)	Steam the carrots until very tender (15 minutes). Either mash the carrots with a potato masher or fork, or puree them in a food processor. Set aside, in a bowl. b)	Combine almonds and 1 tablespoon of flour in a food processor. Grind to make almond flour. Transfer this almond flour to a large bowl and add the rest of the all purpose flour. 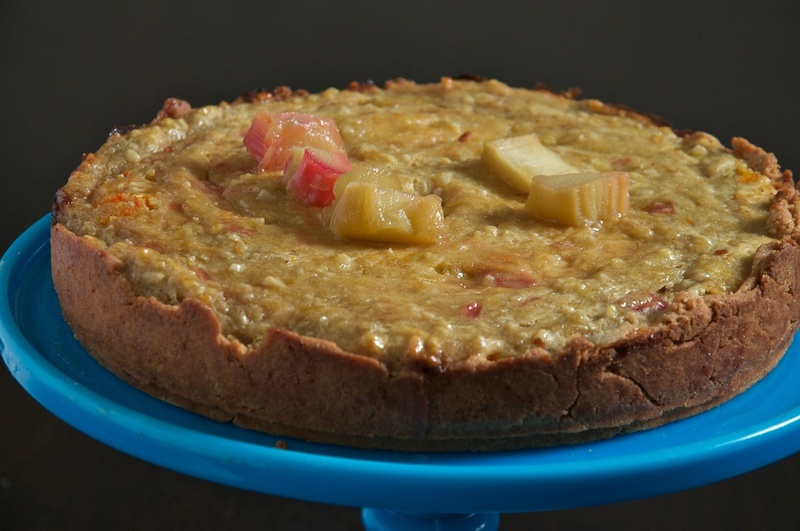 c)	In a large skillet, combined rhubarb and sugar. Cook over medium heat until rhubarb is tender (8-12 minutes, depending on burner strength). Use a slotted spoon to transfer rhubarb to a plate to cool. d)	Heat oven to 350. Roll out dough into a 16 inch round. Fit dough into 9 inch springform pan, pressing into edges. 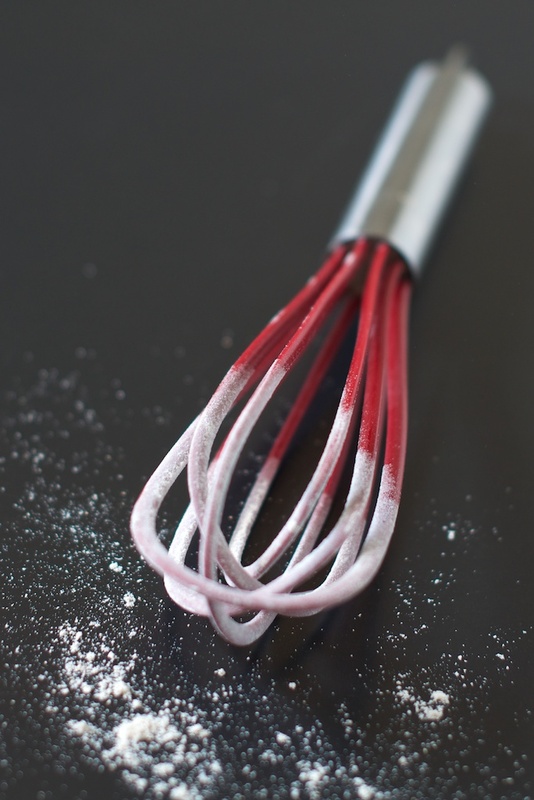 e)	Break out that electric mixer again, this time with the whisk attachment. Beat together the butter and confectioners sugar on medium speed for 5-7 minutes. Add eggs, one a time, then egg yolks, one at a time (making sure each is incorporated before adding the next). Add the flour mixture, cream, and milk. Beat batter until just combined. 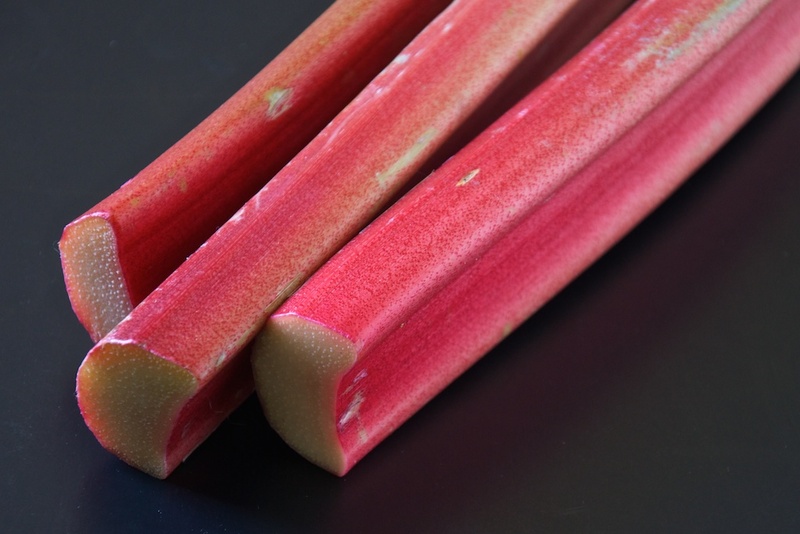 f)	In a bowl, stir together 1 ¼ cups batter and cooled rhubarb. Add ¾ cup batter to the carrot puree bowl, stir to combine. g)	Put remaining batter into cake pan, spread evenly with a butter knife. Put carrot batter into cake pan and spread to create 2nd layer. Put rhubarb batter into the pan and spread for the third layer. h)	Put the cake pan on a baking sheet and bake, rotating pan halfway through, for 40 minutes (or until the cake is set). i)	Reduce oven temperature to 325, tent the cake pan with foil, and back for about 20 minutes more. You want the cake to gently spring back when you touch it. During these final 20 minutes, make your confit and syrup. a)	In a saucepan, combine water and sugar and bring to a boil. Add rhubarb and return mixture to a boil. b)	Remove pan from heat and let sit for 5 minutes. 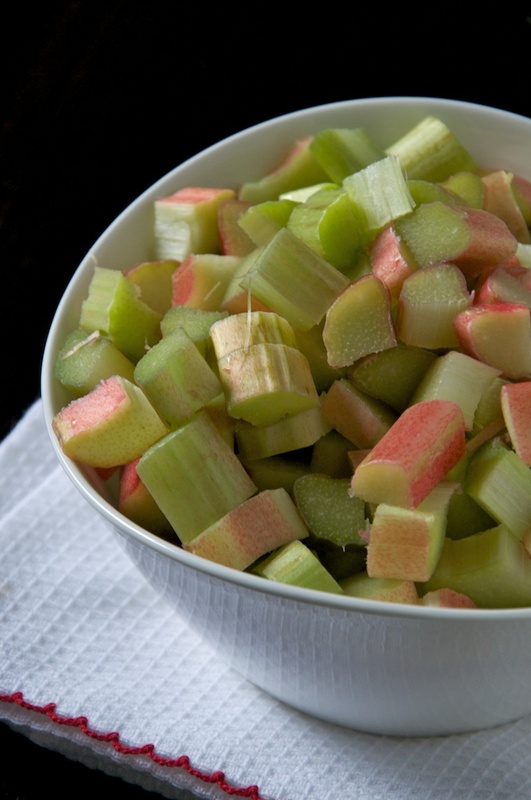 Use a slotted spoon to transfer rhubarb pieces to a plate. c)	Return pan to a boil and boil for 5-7 minutes. Add the rhubarb pieces back to the syrup and then remove from heat. :et the rhubarb sit in the syrup for 5 minutes, before again transferring to a plate. d)	Boil syrup for 4-5 more minutes before adding rhubarb pieces back to syrup. Remove pan from heat. Transfer rhubarb pieces to a plate and reserve syrup. FINALLY: Pull it all together! Remove the cake from the oven and to a wire rack to cool for 5 minutes. Release the cake from pan and brush with ¼ cup syrup. 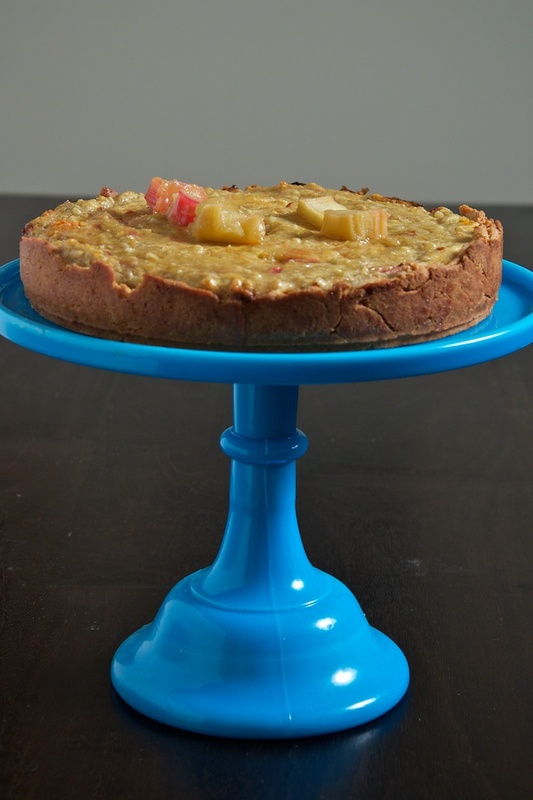 Let cake cool completely and then decorate top with rhubarb confit. Serve cake with remaining confit. Enjoy an extra slice—if you have room!